Now the Boston manhunt has come to its conclusion and the case is waiting, I am left with a broken feeling. Imagine you live in a small, impoverished village in a third-world country like Pakistan or Afghanistan. Imagine that one day you hear a noise overhead, and several seconds later your village and its residents, including your parents and siblings and husband and both your small children, have been mutilated and dismembered. Bodies and parts of bodies are everywhere. You hear horrible screams expressing unimaginable pain and traumatic suffering. Somehow you yourself are spared, and you subsequently learn that everything you lived for and cherished has been destroyed because of a U.S. drone-fired missile. What would be your feelings about the United States of America? Would you ask yourself how this could possibly be allowed to happen? Would you wonder how the most privileged people in the world could be so cruel? Would you do everything in your power to seek retribution? If not, you would be a truly exceptional human being. I absolutely agree that in that situation, in addition to being engulfed in sorrow, I’d be enraged at the perpetrators. But who are they? Whom should I blame? And what should be done about it? …the urge/need to retaliate “in kind” is also NOT going to serve any useful purpose. Will it bring your family back? NO. Will it stop the future bombings? NO…in fact, if anything, it will escalate the cycle and create more heartache for OTHER innocent families. This whole idea of “he/she/they started it” to justify such planned atrocity is EXACTLY the problem. My feeling of frustration the other day stemmed mostly from the fact that these lives were lost and these people were maimed – and we didn’t even know why. It’s not like the finish line of the Boston Marathon is a bastion of capitalism, like the Twin Towers. Horrible as the 9/11 terrorists’ message was, at least it was obvious. What kind of a protest is it that sheds so much blood without leaving us a clue as to the message? What an incredible waste. We have been told that the bombers were two brothers who came to the U.S. about a decade ago. Before that, they lived in a refuge for those fleeing the violence of rebellion – but then the refuge too descended into violence. The younger brother, Dzokhar, who is said to be in hospital and unable to communicate, is 19 years old. 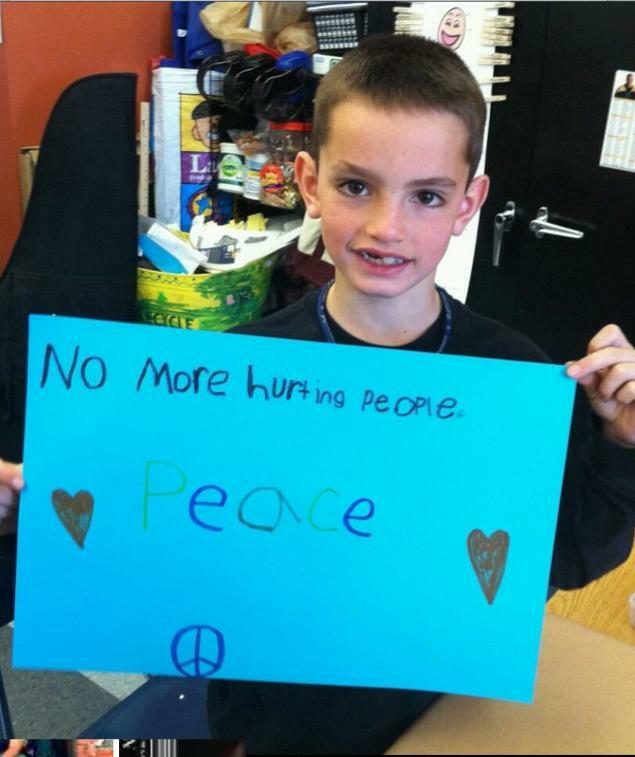 That means he came to the United States when he was barely older than Martin Richard, the 8-year-old who died in the bombing. It’s painful to look at this now-famous picture of Martin, not just because he died so tragically, innocently, and unexpectedly, but also because his message, wonderfully well-intentioned, is not one he could have fully understood as an American boy. The brothers Tsarnaev, when they arrived in America, would have known first-hand what real war looks like. The idea of “no more hurting people” might have seemed like an unattainable dream. I’m not excusing what they did. I’m not saying they had no choice. I’m saying… it’s sad. The older brother, Tamerlan, would have arrived in the U.S. as a teenager; it would not surprise me if he already had a chip on his shoulder, and probably a large one. Dzokhar came of age in the U.S.; he has now lived on this side of the ocean for longer than in his native land. How does a decade go by and lead to this? A kid huddling in a boat in someone’s backyard, covered in blood. That image weighs on me: part hide-and-seek, part wounded animal. Although his brother Tamerlan was apparently a radical Islamist and quoted as saying he had no American friends, Dzokhar was reported to be a quiet, nice boy, a good student, a talented wrestler, relatively well-liked. So how is he also a man who concocts a bloodbath by filling pressure cookers with shrapnel? Every aspect of this makes me sad. It’s so broken. The “immigrant experience” should not end like this. According to The Centre for Research on Globalization: The Chechen origin and reported military training of the two brothers raises some pointed questions about past U.S. support for the Chechen insurgency and who sponsored the brothers to live in the United States, paid for their college tuition, receive [sic] military training abroad, and paid for Tamerlan’s Wai Kru martial arts training in Boston. It does seem like when we pay to arm people in developing countries, it comes back to bite us eventually. There are lots of people praying right now. Of course we pray for the victims and their families, but there is a movement to pray for Dzokhar as well. I’m glad about that, even though there is a certain tone of Let’s pray for the enemy because we’re good Christians/Catholics, or Let’s pray for the enemy, as long as he repents. Insofar as I pray, I will pray for him, as well as the victims and their families, because his life is obviously a nightmare in which he has no idea what to do. If he survives, this will still be true. I’ll admit, I haven’t been following the news that closely after Dzokhar was caught. But one thing I noticed before he was caught, and once they knew who the brothers were, was this seemingly instantaneous leap on the part of just about everyone to say, “Aha, OK, we now understand, it’s foreign Islamic terrorists who did this.” And then they would go interview Dzokhar’s junior high classmates, who all said he was a normal kid. And I sat there and wondered, when does a potentially dangerous foreigner turn into the American who goes crazy? Maybe Dzokhar shouldn’t be compared to Mohammed Atta, maybe he should be compared to Dylan Clebold. I don’t know for sure, of course, but if we continue to see people as “other” when they have, as you rightly point out, spent more time in our country than in their country of origin, we run the risk of fracturing at all the seams, and disproving the hypothesis of a successful democracy created of a mix of people from all over the world. That makes me extremely sad. It’s sad when people die, sadder when they die by the hand of terrorism, and saddest when those who live don’t see any hope that we might all just get along. Thank you for this very insightful and intelligent comment, Helen. Such a good question you pose. In conjunction with it, if Dzokhar and his brother really did/do feel closer ties to their former home than to their current home, what does that say about the Americans they’ve known since they’ve been here, and the way they’ve been treated? I’m not saying that they were bullied or mistreated or that their classmates or whoever led them to these acts of terror, but (as you know more than most) people are so quick to label “foreigners” as “terrorists”, and that can’t help matters when you’ve just moved across the ocean.